Edmonton police conducted an investigation and charged MLA Derek Fildebrandt on June 14, 2016, with leaving the scene of an accident and failing to notify the owner of the damaged vehicle, according to court documents obtained by CBC News. Amy Rawlinson was sitting on the ground floor balcony of her downtown Edmonton condo one morning in June 2016 when she said she saw a neighbour walk out to his red Ford F-150 half-ton truck, back into her company van with a loud bang — and then drive away. As Rawlinson would later testify in court, she knew the neighbour from seeing him around the condo but did not know his name. She came to learn it was current United Conservative Party MLA Derek Fildebrandt. Although his trial for hit and run is ongoing and Fildebrandt has yet to present his evidence, this most recent revelation may render even more precarious his already tenuous tenure within the UCP caucus. Through a UCP spokesperson, Fildebrandt declined to comment. Last week, the fiscal firebrand, a former Alberta director of the Canadian Taxpayers Federation, was outed for renting his government-subsidized downtown condo on Airbnb. Initially defiant, Fildebrandt claimed the controversy was a political smear. 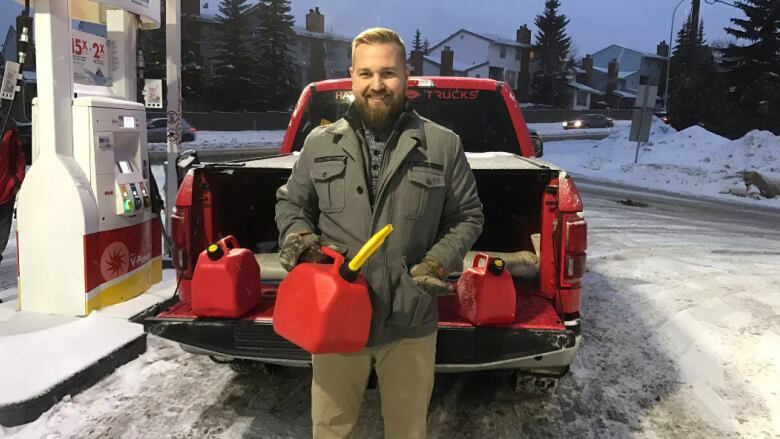 But as the bonfire began to singe the entire party, Fildebrandt issued a mea culpa, said he would send a cheque in the amount of $2,555, the money he earned from the sublets, to the province. He then took a leave from his role as finance critic and left for Europe on what he said was a planned family vacation. Then earlier this week, Alberta Party Leader Greg Clark released records that suggested Fildebrandt claimed food expenses while also claiming per diems for the same meals. Fildebrandt blamed the double-billing — $192.60 over more than two years — on "administrative errors" but said he took full responsibility for the mistakes and would reimburse any discrepancies. A statement released Monday from UCP interim leader Nathan Cooper, however, indicated caucus was losing patience. "These expense claims are concerning and appear to be part of a larger pattern of behaviour that is unacceptable for a member of the United Conservative Party caucus," the statement said. In a statement to CBC News Tuesday, Cooper said he did not know about the charge. He declined an interview request because he said it would be inappropriate to comment while the matter is still before the courts. Court documents obtained by CBC News show Edmonton police conducted an investigation and on June 14, 2016, charged Fildebrandt under the provincial traffic act with leaving the scene of an accident and failing to notify the owner of the damaged vehicle. The documents also show Fildebrandt chose to represent himself at the subsequent trial in early February 2017. At the outset, he asked for an adjournment. He said he had understood that he had to make a formal request to see the evidence against him. But the prosecutor successfully argued Fildebrandt had had six months to do that, but had not. The Crown presented a straightforward case. Rawlinson testified she recognized Fildebrandt from her condo building. After the truck backed into her van, "at first I paused, waiting to see what was going to happen, and he proceeded to drive away," she told the court, adding that she tried to quickly leave her condo to get the licence plate but the truck was already gone. Rawlinson said she filed a police report and when she noticed Fildebrandt at his truck the next day, "I ripped out of my condo to go take a look at the licence plate, which I was able to capture at that time, to communicate to the officers." The investigating officer testified he and a rookie officer he was training took Rawlinson's statement, photographed the estimated $2,000 in damage to the van and charged Fildebrandt. The one moment of drama in the courtroom was when Rawlinson revealed, without prompting from the prosecutor, that Fildebrandt had offered to settle with her just before the trial began. The prosecutor pounced. "In relation to the conversation, do you believe that in any way [the settlement offer] was suggested to influence your testimony here today?" The commissioner allowed no further questions about the alleged settlement offer, because he determined Fildebrandt likely made the offer without prejudice, which meant it was not supposed to be disclosed in the trial. When it was Fildebrandt's turn to cross-examine Rawlinson, the MLA immediately zeroed in on Rawlinson's statement that the accident occurred at about 7:45 a.m. He later indicated that although he did not bring witnesses to the trial, there were roughly 22 "relatively important people" who could testify that he was with them at the time. Before the Wildrose Party merged with the Progressive Conservatives to create the United Conservative Party, there were 22 Wildrose MLAs, including Fildebrandt. Conceding his amateur status in the court, Fildebrandt asked the commissioner to grant an adjournment in the trial so he could gather some of those witnesses. The prosecutor pointed out Fildebrandt had six months to prepare for the trial, and clearly did not. But the commissioner acceded to the MLA's request and adjourned the trial until Sept. 6, when Fildebrandt is expected to present his evidence. If you have any information about this story, or information for another story, please contact us in confidence at cbcinvestigates@cbc.ca. In an earlier version of this story, it was reported that Derek Fildebrandt gave evidence during his hit-and-run trial. In fact, he was cross-examining a witness.